The interaction with dhtmlxVault is highly intuitive. Vault supports drag and drop, has a set of controls for managing files and a clear UI based on Material design. 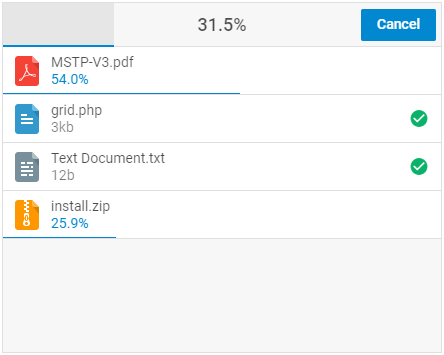 The progress bar shows how the upload process goes illustrating it with the percentage of the upload. Along with uploading files, Vault is able to restore the list of previously uploaded files from the server. Downloading files from Vault to the computer is also possible if there’s a link attribute with the path to the files’ location on the server. Besides, end users can cancel file uploading at any moment. However, dhtmlxVault goes beyond these features and offers a range of options for conveniently managing files with the help of the Events API and API of Datacollection. 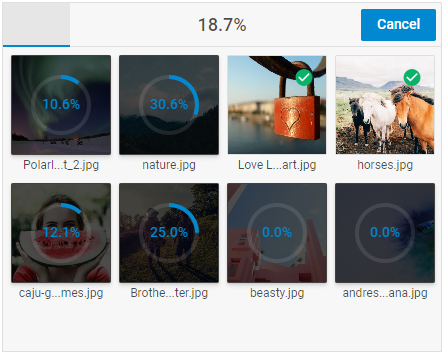 For example, for controlling the upload process, you can put restrictions on the maximum size of each uploaded file or all files for upload, the number of uploaded files or allowable file extensions. Additionally, dhtmlxVault allows filtering and sorting the queue of files by different criteria like file name, size or extension. A great advantage of dhtmlxVault 3.0 is its full customization according to the needs of end users. 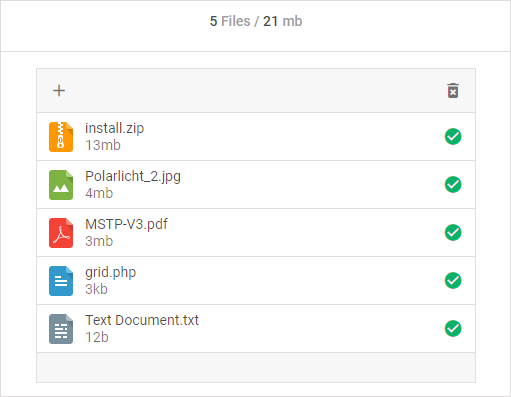 All Vault elements including toolbar controls and files’ icons are easily customized. 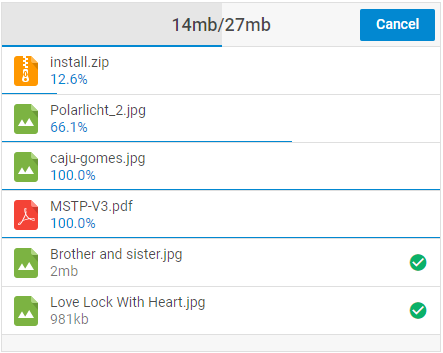 On top of that, you can adjust the progress bar and redefine the logic of progress rendering, so that it will display custom parameters like the file size or time remaining for the upload. And also add an info line to Vault that will show some characteristics of files in the queue such as their size or number. And that’s not a complete list of customization and configuration options available for changing the look and feel of your file uploader. In our docs, you’ll learn how to apply the necessary localization, add a custom scroll, hide the toolbar and much more. dhtmlxVault 3.0 also brings out new server-side options for integrating with PHP, Node, Go, Java and .NET. So, it’s high time to download dhtmlxVault 3.0 free trial and enjoy the new Vault! If you have an active support subscription for dhtmlxVault, await the newsletter with the download link or visit your Client Area.